On Sunday, after a filling and yummy breakfast at Bird-in-Hand, we took the girls on a winding ride through the back-roads of Lancaster. Plenty of fields, farm and cattle as we slowly wound our way on unknown roads. I was looking for something more elusive, and we finally came upon it! For the Amish, church is not found in a building, but in a body of people. Amish church occurs every two weeks, rotating among members of a given church district. An Amish family will prepare well ahead of time for church, cleaning the home and getting together food for the after-church meal. Visiting and viewing a member’s home for church is also an informal means of helping to uphold church standards. Amish housewives in particular will take pains to present a tidy home. 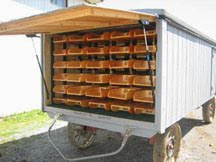 A large enclosed wagon, known as a church wagon, will bring the benches and song books the Amish use to its latest destination. Looking between building we were passing - we found the Church Wagon! While A was doing that, I drained the hot water heater, and then flipped the bypass valve, seen below. We then open the water valves inside, and using a hose adapter, connect a bottle of RV water system antifreeze to the waterworks panel in the basement, and turn on the pump. We keep it on until we see the pink antifreeze run out of all the spigots, and the toilet. This protects all the water lines from freezing in the winter. We also pour a little into all the sink and shower traps. Last thing is to flush out the black and grey tanks, and we were all set for winter. Took a total of about 2 and a half hours, which included some cleaning and repacking of the basement. Next trip out, will probably be in March!